Sunnyside was born many years ago, the name of my fictional home for orphaned children and animals in a story for Mrs. Watson’s eighth grade writing class. A medical degree and six biologic homeschooled children later, Sunnyside became the name of my classical education website, Sunnyside Classical Christian School. Now entering a new phase of life, I plan to rest and reflect on all things true and beautiful here At Sunnyside. Who is the lovely woman pictured in my avatar? Meet my kindred spirit, Euphemia White Van Rensselear, in my favorite portrait painted by George Healy in 1842. According to The Met, Euphemia Van Rensselaer (1816–1888) … was born on the family manor, Rensselaerswyck, near Albany, New York. Healy painted the portrait in Paris, where he executed works for visiting Americans as well as for the French king, Louis Philippe. He blends both lavish detail and texture with a sensitive portrayal of character before a setting suggestive of the Roman campagna from which the sitter had just returned. 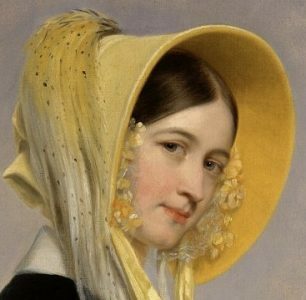 The portrait, which shows the influence of the German-born painter Franz Xavier Winterhalter, demonstrates a stunning simplicity, grace, and vivacity rarely equalled in Healy’s oeuvre. And why is she my face to the world? George Healy – Euphemia White Van Rensselear – 1842. Oh, and here At Sunnyside, absolutely no pronouns will be shamed. If Johann Wolfgang von Goethe thinks man should seek respite from worldly cares by rejoicing in music, poetry, and art, then I have enough good sense to understand that he means all of us. While my own worldview is unapologetically Christian, all polite inhabitants of this glorious world, regardless of pronoun, religious, or any other preference, are welcome to join me here At Sunnyside, where I come to search for both truth and beauty. Johann Wolfgang von Goethe understands why. George Peter Alexander Healy, Euphemia White Van Rensselear,1842 [CC0], via Wikimedia Commons. This post is also found on permanent page Who Am I? I am thrilled to have discovered your blog — in fact, I already ordered your beautiful book which should arrive on Friday.